Go to http://www.winamp.com/player to download the latest Winamp Media Player. Winamp can play and organize dozens of popular media files, whether it's audio CDs, videos, MP3s, or other files. You can configure Winamp to handle the playback of some or all of Winamp's supported media. Click to find out how to make Winamp Media Player as a default player. Please go through the documentation Displaying International (Unicode) Titles With Winamp 5.5x. Click Start on the Windows taskbar. Either click Control Panel or open Settings and click Control Panel. The Control Panel opens. Double-click Add or Remove Programs or Add/Remove Programs. The Add or Remove Programs window opens. Select Winamp in the list of programs. Click Add/Remove or Change/Remove. The Winamp Uninstall window opens. Follow the on-screen instructions to uninstall Winamp. Note: Items such as Winamp Remote, Winamp Toolbar and Emusic Offer have separate uninstall entries. As in previous versions, The Winamp Player is a flexible and sophisticated application for playing and managing your music. With the latest release, the player is easier than ever to use with a new, powerful and intuitive interface. Click on the link below and you can see the Bento skin. Point to a part of the image using your mouse cursor to learn more about each part of the Bento Skin interface. Drag a file from a folder on your computer to the Winamp main window. Click the Open File(s) button and select a file on your computer. Open the File menu and click Open File. With Winamp open, insert a CD into your computer's CD-ROM drive. If you have made Winamp the default player for audio CDs in the Winamp preferences, the CD should play automatically. In case the CD doesn't automatically play, open the File menu and click Play Folder. The Open Folder window appears. Select the CD-ROM drive that contains your audio CD and click OK.
Or use: Main Menu --> Play --> Audio CD X:. The main menu is accessible via the top left-corner icon, or by right-clicking the frame. Note: This method is required for playing Enhanced CDs. 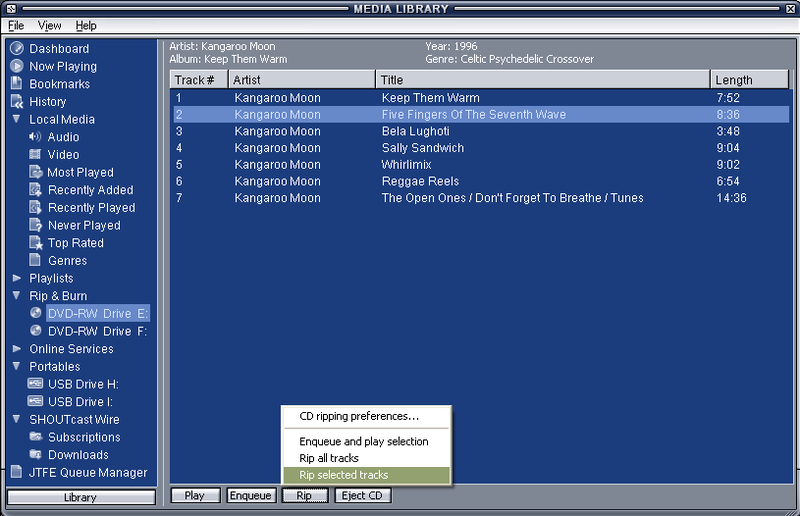 Or open the Media Library, go to your CD Drive listed under Rip & Burn, and click one of the 'Play' or 'Enqueue' buttons. If you are connected to the Internet, Winamp will connect to the CDDB database (Gracenote’s CDDB® database is an online music database that can recognize and display CD track information) to find matching CD information. Winamp5 uses the same, ever-lovin' skinning engine available in the Winamp2 versions of the player. But fear not. You can also use freeform skins (also known as Modern Skins) designed for Winamp3. From the Options menu, open Apply Skin and choose a skin from the list of available skins. If you are a master of the right-click, you can right-click on the Winamp main window and get to the Skins menu. The Winamp® playlist organizes your music files, your videos, favorite internet radio stations and all of your media resources into a single, intuitive interface. If you are using Winamp for the first time, then the playlist may be empty. A playlist lets you keep a list of tracks to play whenever you want. You get to keep your choice and order of tracks. Open the Main or View menu and select Playlist Editor. To load a playlist Open the File menu and click Open Playlist. Click the Manage Playlist button and select Open Playlist from Media Library. Or for Classic skins you can right-click the List Opts button to access the same menu. Or right-click on the frame or any blank space in the Main or Playlist windows (or use the Main menu from the top left corner icon) and select Play > Playlist from Media Library. Or open the Media Library window, and load a playlist via the Playlists view. Add Button: Click this button for track addition options. Add files(s): Add files from your computer to the current playlist. Add directory: Add a directory on your computer to the current playlist. Add location: Add an Internet location to the current playlist. Rem (Remove) Button: Click this button for removal options. Remove selected files: Remove the selected tracks from the current playlist. Crop selected: Only keep the selected tracks, while removing others. Clear playlist: Remove all the tracks in the current playlist. Remove all dead files : Remove tracks that have missing, moved, or deleted files. Physically remove selected file(s): Delete selected tracks from your computer. Caution: Using this option will permanently remove the selected tracks from your computer and they will be irrecoverable. Remove duplicate entries : Remove any multiple entries of the same file. Sel (Select) Button: Click this button for selection options. Select all: Select all of the tracks in the current playlist. Select none: Select none of the tracks in the current playlist. Invert selection: Select all of the unselected tracks in the current playlist, and clear the selected tracks. Misc (Miscellaneous) Button: Click this button for miscellaneous options. File info: Display detailed information about the selected track. Playlist entry: Change the file location associated with the select track. Sort list by title: Sort the playlist by title. Sort list by filename: Sort the playlist by the filename of each track. Sort list by path and filename: Sort the playlist first by path and then by filename. Reverse list: Reverse the current order of the playlist. Randomize list: Shuffles up the current order of the playlist. Generate HTML playlist: Create an HTML version of the current playlist. Read extended info on selection: Read any additional information from the ID3 tag for the selected track. Manage Playlist (Miscellaneous) Button: Click this button for list-related options. Open playlist: Open a saved playlist. Open Media Library view results: Open a Local Media view from the Media Library. Open playlist from Library: Open a playlist saved in the Media Library. Save playlist: Save the current playlist. New playlist (clear): Clear the current playlist. Manage Playlist: Open the Playlists panel of the Media Library. Once you've got the tracks you want in your playlist, make sure you save it for future generations. Open the File menu and click Save Playlist. The Save Playlist dialog box opens. Choose a folder where you want to save your playlist. In the File name field, type a name for your playlist. In the Save as type drop down list, choose M3U Playlist or PLS Playlist. M3U is fine in most situations. If your playlist contains international (unicode) titles, then you should select M3U8 Playlist. Click Save to save your playlist. Open the Media Library and click Playlists in the left pane. Click the Import button at the bottom of the right pane. The imported playlists appear in the list above. To search a large playlist, whilst the Playlist Editor window is in focus, hit the 'J' or 'F3' key on your keyboard to open the 'Jump to File' dialog. The entire playlist will initially appear in the search results, and will be filtered-out as you type into the Search field. Tip: By default, the search results will match any of the Artist, Title and containing Folder criteria. To fetch results for Album or any other fields from the file tags, first you will need to adjust your Advanced Title Formatting syntax for the Playlist Editor accordingly. Note: The JTF dialog can be configured to taste via the Jump to File Options. To queue up a song in the Playlist Editor, either highlight the playlist entries and press the 'Q' key, or hold down the Alt key and left-click your selection, or right-click one of the selected entries and click 'Enqueue selected' via the 'Jump to File' submenu. Note: You can manage the Queue via the "Enqueue List" page in the Jump to File Options, or via the "Jump to File" dialog (see screenshot below). Click the large "Search mode" button to switch the dialog to "Manage mode". What do you expect from a fully customizable media player? Lots of options and preferences? Yes, you are correct. We have one of the most comprehensive list of options you can play around with. Open the Options menu and click Preferences. Press the CTRL+P keys on your keyboard. Right-click in the Winamp main window, open the Options menu, and click Preferences. For quick information about a preference, place the mouse cursor over a preference, radio box, or checkbox. A tooltip will appear explaining the preference. To learn more about Preferences and each & every option, check our Winamp Preferences guide. Winamp features a complete Media Library that gives you access and organization over your media content, both online and offline. Bookmarks: For storing quick links to your favorite online streams. History: Keeps track of when and how many times any items (remote streams, local media, etc) are played through Winamp. Local Media: Displays files on your computer that you've added to the Media Library. To add files to your media library, click "Add Media to Library" via the "Library" button, then select a folder that contains the media files you want to add. Audio: Displays audio files in the Media Library based on artist, album, or genre. Video: Displays video files in the Media Library. Smart Views: Create your own Smart Views with the powerful Query Editor. Playlists: Allows you to create and import playlists. Playlists added to the Media Library are listed underneath this option. Rip & Burn: Lists your CD/DVD Drives and provides the interface for ripping and burning Audio Cds. Portables: Lists the portable media devices connected to your computer that Winamp can manage, such as: iPod, Creative Nomad, USB Thumbdrives, PlaysForSure (P4S), Android and ActiveSync Devices, etc. Online Services: Lists SHOUTcast Radio and TV stations that you can search by keyword, bandwidth and genre. Also includes: 7digital mp3 store, exfm, TourTracker, AOL Radio (USA-only), Ourstage Radio, Lyrics services, and more. Podcast Directory: Allows you to download and subscribe to over 30,000 audio and video podcasts. To directly add podcast RSS feeds to your subscriptions, click on the "Add" button in the Subscriptions view and input the feed in the field box. Subscriptions: Allows you to manage all your subscribed and downloaded podcasts. Add and delete subscriptions, manage preferences, and download and stream podcasts from this view. Downloads: Displays the progress and history of media downloads from online services. This view will only be displayed when downloads are currently available to view. 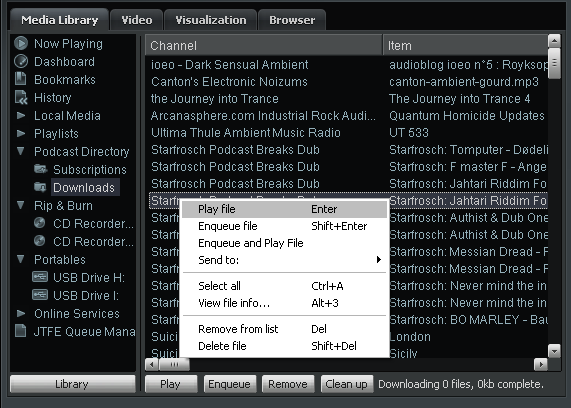 Winamp Add-Ons: A search portal for discovering new Skins and Plugins. If the Media Library isn't open, open the View menu located in the Winamp main window and click Library or by pressing ALT+L on your keyboard. Select the folder that contains the media files you wish to add. Note: Winamp will scan the folder and all its sub folders for supported media files. You should scan a specific folder (C:\My Music) rather than your entire hard drive (i.e. C:\) to shorten the time it takes for Winamp to scan for files. To add single files to the Library, right-click items in the Playlist Editor window, and select: Send To -> Add To Local Media. If the Media Library isn't yet open, open the View menu and click Library. Click Local Media in the left pane of the Media Library. In the Search field, type a search term. As you type, matching tracks are displayed. Click Online Services in the left pane of the Media Library, then click Shoutcast Radio underneath. In the Search field, type a search term, such as a station name, song, artist, or genre. As you type, stations that contain the search term you type are displayed. Click Online Services in the left pane of the Media Library, then click Shoutcast TV underneath. The Online Services view lists Shoutcast Radio & TV stations, a selection of AOL & CBS Radio stations (USA-only), Winamp Charts, plus a host of various other 3rd-party services - some handpicked by us, some submitted by 3rd-party developers. To subscribe to Channels, open the Media Library and go to the Online Services root view in the tree (left pane). Note, all the Channels are free, but some are ad-sponsored. Under the Featured, Most Popular and Recently Added tabs in the right-pane, select the Services/Channels you would like to subscribe to by clicking on any listed Service and then clicking the "Add to Winamp" button. These will then appear underneath the Online Services view in the left pane of the Media Library. Select any of these to view the available content in the right pane. The example covered below is of the SHOUTcast Radio view. You can use the Navigation Bar along the top to go Back, Forward, Home, Reload, or Stop. You can also right-click on the Navigation Bar itself to access options where you can set it to appear at the top or bottom, or also set it to auto-hide (where a mouseover will then make it auto reappear). You can also right-click on any of your subscribed Services (listed in the tree under Online Services in the left pane) to access a menu where you can Rate, Remove, Report or Get Info about that particular service. These same menu items are also available via the Options button on the far right of each subscribed channel's Navigation Bar. Please also check out the SHOUTcast Getting Started Guide. Winamp Online Services is a powerful new way for web developers to create engaging content for millions of Winamp users. However, with great power comes great responsibility. Since online services have access to more information from the Winamp client than an ordinary web page, it is very important that we provide some mechanism to provide security for the users. There are certain activities that online services can perform that are not considered a security risk, for example, examining the current position of a song being played. However, for others a security dialog will be presented whenever a service tries to perform the action for the first time. Replies, either Allow or Deny, to security prompts are saved for each online service. Allow: Allows the online service to perform the action. It will also automatically ALLOW other related actions. The list below will identify which actions are related. Deny: Does NOT allow the online service to perform the action. It will also automatically DENY other related actions. Apply to all requests from this service: When this checkbox is selected, the choice (Allow or Deny) will be used as the response to all subsequent security prompts for this service. This is a quick way to indicate that a particular online service should be allowed or denied (depending on the button pressed) to perform all actions. This service is trying to control playback: The online service is attempting to Play, Stop, Pause, Jump to the previous track, or Jump to the next track. Play provides the filename/URL of the asset being played. Stop provides the current position where playback was halted. End of File indicates that the end of the asset has been reached. Pause provides a flag indicating whether the player was paused or unpaused. End of File happens at the end of an asset before the next one is played. This service is trying to get information about the currently playing song: The online service is requesting "Metadata" information from the current asset. "Metadata" is additional information that MAY be part of the asset, such as author or title, that is not actually part of the song itself. The existence of metadata depends on the format of the data and whether it was added when the asset was digitized. This service is trying to access your active playlist: The online service is trying to alter the Play Queue. It may be trying to play a single asset, add assets to the queue or clear the queue. This service is trying to get information about an item in your Play Queue: The service is trying to gather information about an asset within the play queue. This service is trying to access the playlists in your media library: The online service is trying to obtain a list of all Winamp playlists known to your Winamp client. It may also be trying to open a playlist to manipulate the assets within or it may be trying to save a modified playlist. This service is trying to access your bookmarks: The online service is trying to create a bookmark in your Media Library Bookmarks. This service is trying to subscribe you to a podcast: The online service is trying to subscribe to a podcast and add an entry in your Media Library Podcasts. This service is trying to provide metadata to Winamp: The online service is trying to add metadata for an asset. This might be useful if the online service can provide better metadata than comes as part of the asset itself. This service is trying to access information about media supported by Winamp: The service is trying to determine if the Winamp client supports a certain encoding formation, for example "mp3". This service is trying to access information about media on your computer: The online service is attempting to get metadata from an asset. 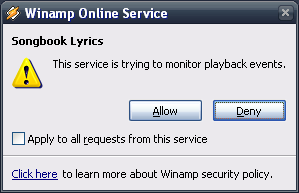 This service is trying to access your playback history: The Winamp History is a collection of information about the assets you play, how many times they were played and when was the last time they were played. It is used to determine what the users favorite songs are. This service is trying to launch a website in the browser: The online service is trying to launch a new web site in the browser. The browser may be internal to Winamp, which means it could be an online service or it could be launched in an external browser where it does not benefit from the online services api calls. This service is trying to access information about Winamp: The online service is trying to gather information regarding the version of Winamp or the language pack that is being used by Winamp. This service is trying to access your skin settings: The online service is trying to obtain information regarding the current skin used by the Winamp client. This could be used to synchronize the colors of the service with that of the Winamp player. Winamp can manage many Portable Media Players and Devices. Connect your device to the computer, go to the Devices view in the Media Library, then select your portable player in the list underneath to view all the songs currently stored on the device. For more info, check out the Winamp Portables guide. Podcast Directory lists over 30,000 free audio and video podcasts to subscribe and download. To access the directory, open the Media Library and click Podcast Directory in the left pane. Podcasts can be streamed directly from the source or downloaded for playback. Search and Discover Podcasts Discover podcasts by using search, browsing by category or channel and using the 'Most Popular' and 'From AOL' tabbed listings. The podcast search box sits at the top of the directory listing and allows you to search by podcast names and description keywords. Category browsing lists podcast within a particular topic and Channel browsing lists all available podcasts by a particular publisher. All directory views can be sorted by user ratings and by alphabetical order. Subscribing To subscribe to a podcast from the directory, click the “Subscribe” button underneath the podcast thumbnail. To add a podcast directly to your subscriptions using an RSS feed, click the "Add" button in the Subscriptions view, paste in the URL and click "Add." All podcasts that you subscribe to will now appear in the Subscriptions view. Subscriptions View The Subscriptions view under the Podcast Directory allows you to manage your podcast subscriptions. View podcast shows in the left pane, podcast episodes in the right pane and podcast detailed information in the bottom pane. Use the displayed buttons to Add, Remove, Refresh and Edit to manage podcasts. Preferences Podcast preferences allow you to set frequency of automatic subscription updates, set automatic downloads of new episodes and set the download location for podcasts. You can edit the default settings in the Podcast Directory Preferences. To set individual podcast preferences, select the podcast show in the Subscriptions view, and click the “Edit” button. Adding Podcasts Podcasters who do not find their content listed in the directory, submissions can be made through Winamp. To manually subscribe to a podcast from an external website, copy the URL of the RSS Feed supplied by the website, click the 'Add' button under the Channels pane, and paste in the URL. Note, that you can also manually subscribe to feeds via the "Add Feed" field in the Podcasts Directory root view. You can manage your downloaded podcasts via the Downloads view. Use the buttons or right-click menu to Play, Enqueue, Remove or Delete selected items. Note that the Delete action will physically delete the saved podcast file from your hard drive (whereas the Remove action will just remove it from the Downloads list). Note: We recommend that you go to the Podcast Directory Settings first, where you can set your personal choice of folder for storing downloaded podcasts, or where you can change the default frequency for automatic Subscription Updates, if required. Right-click items in the Local Media section of the Media Library or in the Playlist Editor window and select "Play tracks similar to...". On first use, the Playlist Generator dialog will appear and prompt you to Scan your Media Library. Alternatively, go to the Winamp Preferences (Ctrl + P) and navigate to: Plug-ins --> Media Library. Double click Nullsoft Playlist Generator (or highlight it and click the 'Configure' button). In the Winamp Playlist Generator configuration dialog, click the Scan button. The Playlist Generator will now proceed to scan all the Local Media audio files in your Media Library. Note: the Scan may take a little while. The more files in your library, the longer the complete scan will take. You can close the Configuration dialog if you wish, by clicking the OK button, and the scan will still continue in the background. Once the Scan is complete, you are now ready to use this feature. You can now right-click any local music files listed in your Playlist or Media Library and select: Play tracks similar to (title). The Playlist Generator will then add between 10 to 200 (depending on what figure you select in the configuration) acoustically similar tracks to your playlist, starting with the selected file, and will begin playing them. Music recognition technology and related data are provided by Gracenote. Gracenote is the industry standard in music recognition technology and related content delivery. For more information visit www.gracenote.com. CD and music-related data from Gracenote, Inc., copyright © 2007 Gracenote. Gracenote Software, copyright © 2007 Gracenote. This product and service may practice one or more of the following U.S. Patents: #5,987,525; #6,061,680; #6,154,773, #6,161,132, #6,230,192, #6,230,207, #6,240,459, #6,330,593, and other patents issued or pending. Some services supplied under license from Open Globe, Inc. for U.S. Patent: #6,304,523. Gracenote and CDDB are registered trademarks of Gracenote. The Gracenote logo and logotype and the "Powered by Gracenote" logo are trademarks of Gracenote. Want to have your CDs available on your computer? Winamp lets you rip (transfer and compress digitally) your CDs to your computer hard drive. This means you can listen to them without having to pop in the CD. It also means you can create your own playlists using individual tracks from different albums. Note: Before ripping tracks to your computer, you should first configure the CD ripping settings. For more information, see Media Library Preferences: CD Ripping. Insert a CD that has tracks you want to transfer to your computer hard drive. Open the View menu in the Winamp main window and click Media Library. On the left side of the Media Library, click on your CD drive within the Rip & Burn list. You may have to double-click Rip & Burn to see your list of CD/DVD drives. If you don't see the Rip & Burn node, then go to: Winamp -> Preferences (Ctrl+P) -> Media Library -> Tree Options tab and checkmark "Group CD Drives under the 'Rip & Burn' parent". A numbered list of tracks appear in the track list on the right. CDDB will automatically fill in the Titles, but if you wish to manually edit any of the CD Information first, right-click anywhere in the window, and select Edit CD Info. If you want to rip some of the tracks on your CD, select the tracks you want to rip in the track list. You can keep Ctrl pressed down to select more than one track. Rip selected tracks: Click this to rip the tracks currently selected in the track list. Rip all tracks: Click this to rip all of the tracks on your CD, regardless of the currently selected tracks. The status window appears to show you track ripping progress and speed. When done, the ripped tracks will be available in your Local Media views (Audio, Recently Added, etc) and will be physically located within the folder you specified in the Media Library: CD Ripping Preferences. For further in-depth information, a full comprehensive CD Ripping Tutorial by Gaekwad2 can be found in the Winamp Forums. Winamp makes the joy of burning (creating) your own music CDs even easier with built-in CD burning. Add individual tracks, a folder, or just burn the playlist you're listening to right now. Insert a blank CD-R or CD-RW into your computer's CD Recorder. Open the View menu in the Winamp main window and select Library (or press ALT+L) to launch the Media Library. Note: You may have to double-click Rip & Burn to see your list of CD/DVD-RW drives. If you don't see the Rip & Burn node, then go to: Winamp -> Preferences (Ctrl+P) -> Media Library -> Tree Options tab and checkmark "Group CD Drives under the 'Rip & Burn' parent"
Files: Click this to add one or more files. You can keep CTRL pressed down to select more than one file. Folder: Click this to add all the files in a folder. Current Playlist: Click this to add the tracks in your current playlist. Note: As you add tracks to burn, the used and available time is displayed above the list. Make sure you do not exceed your blank disc's capacity. Using the Playlist view of the Media Library, create a new playlist or import an existing playlist. Switch to that playlist by clicking it in the left pane of the Media Library. Click the Manage Playlists button located within the Playlist view, and select: Send playlist to > CD Burner. Note: This action will queue all the playlist items into the CD Recorder view. This method is not recommended for using with large playlists where the total time would greatly exceed the burn limit! Switch to the CD Recorder view to burn the CD. You can rearrange the Track Order by dragging selected items up and down the list, or by right-clicking and selecting 'Move selected items up/down'. Similarly, You can remove undesired tracks from the Burn List by using the Del key, or by right-clicking and selecting 'Remove selected items'. Click Burn when you are done adding tracks to the list. The final dialog box for burning appears. Burn speed: Use the drop-down list to select the speed at which you want to burn your tracks. If you have Winamp Pro, you can select the maximum speed that your CD recorder allows. Enable burn-proof mode: Select this to help ensure that CD burning doesn't fail. Test mode: Select this to do a test burn that doesn't actually affect the CD. Click Burn to start burning your tracks to CD. 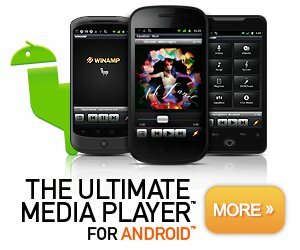 Please visit the Winamp For Android Help section. Please visit the Winamp For Mac Help section. Tip: For more technical support information, visit the Winamp Forums. If The CD ejects without writing audio files, close and reopen Winamp. If this does not solve the issue, reboot the computer or try reinstalling Winamp. This issue may affect users with the PHILLIPS CDD4801 CD-R/RW burner. Static/whitenoise when pausing & resuming playback? Go to: Winamp > Prefs > Plugins > Output > DirectSound > Configure, and checkmark "Old style fade on pause" under the "Fading" tab. This issue may affect users with Soundmax onboard sound chips. The fullscreen video OSD in Winamp 5.57 (or above) is never displayed? The fullscreen OSD requires DirectX 9 to be present, plus d3dx9_24.dll (Win2k/XP) or d3dx9_32.dll (Win7) or higher. The Winamp installer should have already detected your DirectX version and, if required, either upgraded it or installed any missing files. If for some reason the DX9 upgrade failed, then you can download it manually from here. We have also identified an issue where the OSD does not display on PCs using the Intel(R) 82945G Express Chipset with Intel drivers version 6.13. Upgrading the drivers to 6.14 (or newer) solves the problem. Need to contact Winamp Pro support? Refer to the Forum FAQ to contact Tech Support or use DigitalRiver Customer Care. A full comprehensive list of minor Common Issues can be found in the Winamp Forums.